A serendipitous find! 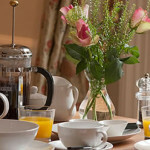 A B&B that will fulfil all your needs, especially at breakfast. Owners Emma & Dave have a guest house with good sized comfortable spotlessly clean en-suite rooms. Emma & Dave made us feel very welcome and nothing appeared to be too much trouble. This was our first visit and we have already booked a weekend for Oct 2015 Goth weekend, but we will be visiting again long before then. Little touches like a list of eateries recommended by previous guests, places to go, even instructions on how to use the radio alarm all make a visit comfortable. We cannot praise this delightful B&B and its owners highly enough. You must experience this yourselves.